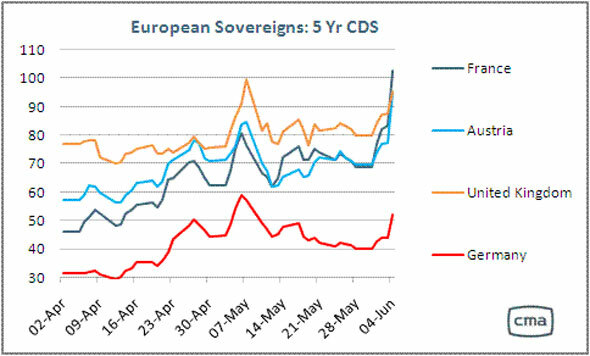 GRAPH: 5-year CDS are trending up sharply in Austria, France, Germany and the UK. 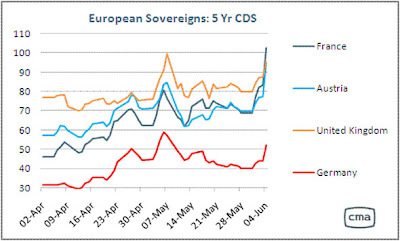 While France and Germany were hit for their banks' exposure to the PIIGS countries, new woes in Hungary and Romania sent Austrian CDS to a record 90 basis points, meaning it costs now €90,000 to insure €10 million government debt of this still AAA-rated nation. Chart courtesy CMAvision. Click to enlarge. Austrian bank shares were sharply lower: Erste Group with 91% of its business in Central Eastern Europe (CEE) shed 8.8% to €25.71 at the time of writing. Raiffeisen International, soon to be merged with unlisted Raiffeisen Zentralbank, gave up 9.1% to €30.89.